Songs of Eretz Poetry Review: New Poem: "Of Ferns and Frost"
"Of Ferns and Frost" is the latest addition to my Snowetry collection. 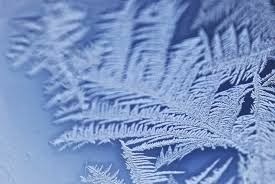 I found myself thinking about the beautiful, feathery pattern that frost makes on a windowpane. This caused me to think of ferns and then of ferning. "Ferning" is the feathery pattern that dried amniotic fluid makes, when viewed under a microscope. Checking for ferning is used to determine whether or not rupture of the membranes of pregnancy has occurred. I see the hand of God in this feathery pattern that is found in animals, plants, and inorganic ice crystals.